An e-waste broker in Michigan pleaded guilty last week to illegally shipping used CRTs to Hong Kong and China, and falsifying export records which stated the shipping containers contained plastic and scrap metal. According to the Department of Justice, Michigan resident Lip Bor Ng, also known as Paul Wu, repeatedly exported CRTs to Hong Kong and China, without filing the appropriate paperwork with the EPA, and without attaining the required consent from these countries to accept this hazardous waste, as required under the EPA’s CRT Rule . Ng faces a maximum sentence of five years imprisonment and a $250,000 fine. Sentencing is set for July 14, 2015. This case is a great example of activity we believe occurs on a regular basis. People acting as export brokers (often very small operations) load up containers of CRTs, and lie on their customs documents where they declare the contents of the shipments. 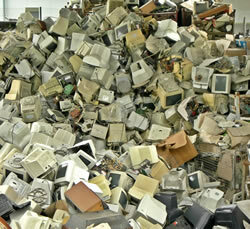 In this case, the exporter said he was shipping plastic and scrap metal, not CRTs. This is the reason why research on e-waste exports that is based on official export records is very unreliable, and grossly understates the amount of e-waste being exported. Smugglers are not going to say they are exporting CRTs. This is illegal to export from the U.S. to China or Hong Kong, and it’s illegal for those countries to receive it. So the exporters lie about the contents, and say it’s plastic or scrap metal. We believe the volume of illegal CRT exports is increasing, because of the high cost of managing CRT glass, which is laden with lead, and contaminated with toxic phosphor powder, in a responsible manner. Part of the problem is that there are few options for where to send CRTs for legal processing, as CRT manufacturing has been replaced by flat panel production globally. And the few remaining options are expensive – they cost recyclers money, as opposed to earning them money. As a result, we have millions of pounds of CRT glass being stockpiled in warehouses, outdoor heaps, and containers across the country, largely collected by recyclers who can’t afford to send them to smelters or other processing. Some of these pounds were collected on behalf of manufacturer takeback programs, but recyclers did not get paid enough to properly manage the glass. So there it sits. With the cost of CRT processing being as high as it is, there is more incentive than ever to simply export whole CRTs out of the country, as that Michigan broker has been doing. This case involved collaboration between the Dept. of Justice, the EPA, and U.S. Immigration and Customs Enforcement, and the U.S. Postal Inspection Service. We applaud these agencies for their work to investigate and prosecute this case. We hope they will continue their efforts to stop these illegal exports of hazardous waste.